Carl Moser's excellent assembler/text editor for the 6502 Microprocessor has been reviewed superficially in several publications.1,2, So far, no one has done an in-depth write-up for a PET owner who wants to understand or modify his copy. The manual provided by Moser is adequate, but sketchy in some areas. I, for one, would like to see some articles by users who have figured out solutions to problem areas. For example, PET owners find out (on page 35 of the manual) that "At present, the ASSM/TED does not contain a printer subroutine...". In another area, the ASSM/TED is designed for a "standard" PET and utilizes the audio cassette drives for off-line storage. The manual (Sections 6 & 7) discusses configuring the ASSM/TED for disk operation and using it with disk. This discussion is too brief to be understandable by a novice assembly language programmer. In still another area, the editor has many powerful capabilities and will accept a full line of characters (65 typed characters) but the sense of the shift key is reversed. That is, shift gives lower case letters. Unshifted gives upper case letters. This proves to be cumbersome when typing a letter or manuscript from the PET keyboard. 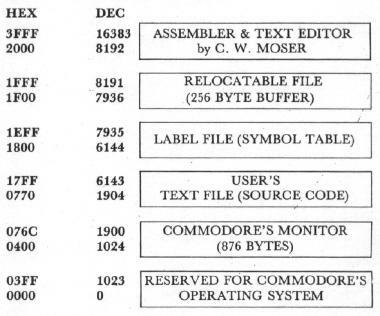 In an effort to shed some light for others, who like myself, are trying to understand and modify their copy of ASSM/TED and perhaps stimulate some of you to share your findings, I am submitting some areas that I have uncovered in Moser's Assembler. Figure 1 shows a memory map of the assembler/text editor. The assembler is written for a 16K PET and fills almost all useable memory space. As the figure shows, the assembler and text editor are co-resident and occupy the space from $2000 thru $3FFF. Commodore's monitor occupies the area from $0400 thru $076C. This leaves enough memory for a relocatable file ($1F00 thru $1FFF), a lable file ($1800 thru $1EFF), and approximately 4K for user programs ($0770 thru $17FF). Table I is a list of addresses of major routines. This is a fun table — try some experimenting with it. For example, RUN 8390 will assemble your program. RUN 8390 LIST will assemble and list. RUN 8470 will print your program. Table II provides a list of addresses of the pseudo opcode routines, while Table III contains some interesting areas that will be helpful to someone modifying his assembler. Carl Moser's ASSM/TED is a very good program and will allow the PET owner to convert his PET into a 6502 development station with a little effort on his part. If the PET is equipped with a line printer off the IEEE port, the owner can easily get around the first problem area and get a listing of his source code and/or his assembly. This subject will be treated in PART II of this article. 37E2 14306 Moser suggests this location for a JSR to a line printer routine written by the user. The routine at 13019 would call this subroutine.